lululemon athletica is one of several retailers set to post second-quarter results over the next few trading days. 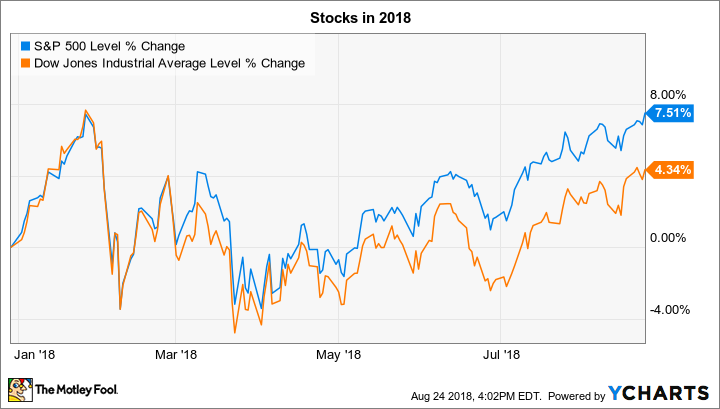 Stocks rose last week, as both the S&P 500 (SNPINDEX:^GSPC) and the Dow Jones Industrial Average (DJINDICES:^DJI) gained just under 1%. The boost put the S&P 500 back at all-time highs while the Dow still has some climbing to do before recapturing the record it set earlier in the year. For the week ahead, investors remain focused on second-quarter earnings reports. Below, we'll take a closer look at the announcements that could send shares of Campbell Soup (NYSE:CPB), lululemon athletica (NASDAQ:LULU), and Ulta Beauty (NASDAQ:ULTA) moving over the next few trading days. Lululemon's second-quarter growth rate isn't likely to approach the market-thumping 19% spike the company managed last quarter. After all, that figure was pushed higher by a comparison to an unusually weak prior-year period. Those comparisons get harder as the retailer progresses through the year, but investors still have plenty of reasons to expect good news from the apparel specialist on Thursday. Lululemon is seeing healthy customer traffic growth both in stores and in its e-commerce division these days. And, with new product releases resonating with yoga fans, prices are climbing across those sales channels. That helps explain how gross profit improved to 53% of sales last quarter from 50%, and how operating margin leapt to 16% from 12%. Investors will be introduced to new CEO Calvin McDonald, who is in just his first week in the leadership position. Thanks to the healthy trends at the business, McDonald isn't likely to announce any major strategic changes as part of his appointment but instead should be focused on maintaining and extending Lululemon's positive momentum. Ulta Beauty will announce its results after the market closes on Thursday. At its last outing, the spa and beauty products retailer posted a solid 8% sales increase. However, that marked its fourth straight quarter of slowing growth. Ulta Beauty's profitability dropped, too, as the company spent more heavily to build out its digital sales channel. The combination of those two trends, slowing growth and falling profitability, have investors feeling less optimistic about this business, but CEO Mary Dillon and her team still see lots of room for growth ahead. New store locations are meeting or exceeding cash flow targets, they point out, and Ulta Beauty is enjoying rising traffic both in stores and online. Assuming only a modest disruption from the slowdown in the broader cosmetic industry, those metrics suggest the company could still expand toward its 1,700 store long-term goal -- up from about 1,100 today. Thursday's earnings report by Campbell Soup will see more investor attention than usual. For one, the struggling packaged foods specialist is hoping to post a modest growth rebound after its last quarterly announcement disappointed Wall Street. Organic sales were flat even as profitability sank due to a painful combination of falling prices and rising input costs. Campbell Soup also took a massive writedown for its fresh food division that investors are hoping will be the last such charge for this unit. The bigger news of the day might not involve operating results, though, as management has promised to reveal the conclusions from its comprehensive strategic review on Thursday. The executive team has been looking at the company's challenges with what management called a "heightened sense of urgency," and we'll find out whether they've decided to make big changes, such as a spin off, merger, or restructuring plan this week. Shareholders are likely to insist on a new direction, especially as Campbell Soup closes the books on its third straight fiscal year of falling profits.